Thank you very much for continuing development on this exellent tool! Before adding modding support, please focus on core functionality, like zoom out (negative zoom) and also a refresh button. Looking forward to future versions! Ive got a point of interest editor for html version if you want. An erlier version tracked the player position in real time, will this b returning? I find it too easy to get lost and I used it alot. Thanks. Can we get it to zoom in on the HTML output 2 more levels though? Not quite enough detail for my maps. Biomes o Plenty not quite supported yet either? Yes, I’m working on a reader for the new chunk format appeared in Minecraft 1.13. 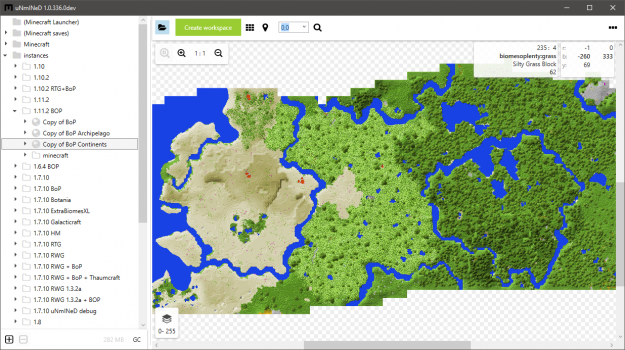 Is there any possibility of adding a biome overlay (just with names and random colors, to see and differentiate them at a glance) onto the 1.12 version? Or even just biome IDs as they appear in the save would be awesome. Is there any way we can at least test the development versions? I want to export a 1.12.2 map as a large image so I can do some web-design with it, but I cant find any other tool to do it! so, whats the project release date? I’m very interested to know if you’re making progress on making this fun tool work with 1.13! I’d be a patron if it were an option.